London, UK, Jan 16, 2013 - Emily Penn, world-class sailor, oceans advocate, plastic pollution expert and tireless campaigner for a cleaner environment is Aquapac’s 2013 Aquapac Outdoor Champion. Designed to showcase individuals whose accomplishments highlight the perfect blend between conservation and recreation, the Aquapac Outdoor Champion is awarded $1,500 in cash from Aquapac in recognition of her achievements and to support her future endeavors. The winner also receives a healthy selection of Aquapac’s 100% waterproof cases and bags. Penn’s passion for conservation includes an endless education and outreach effort designed to promote the use of alternative fuels. She now organizes and leads expeditions to tackle challenges facing the marine environment. Past recipients of Aquapac’s Outdoors Champion program include voyager Sarah Outen, nature photographer Daniel Fox and adventurer Dave Cornthwaite. In order to protect her equipment while at sea, Penn relies on Aquapac’s waterproof iPad case to keep her primary navigation device dry on deck. 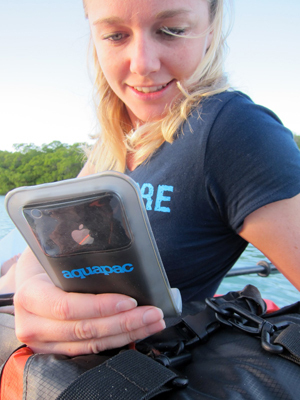 She also uses the iPhone case and hard lens camera case from Aquapac’s submersible range to keep her equipment dry. Check out the full interview with Emily via Aquapac’s blog at aquapacblog.blogspot.com. ABOUT AQUAPAC: Aquapac is a London-based company, with U.S. headquarters in East Norwich, N.Y. It produces 100% waterproof, 100% use-through cases that create a virtual second skin for personal electronics, photography equipment, maps, documents and other essential items. Aquapac was started in 1983 by windsurfers needing to waterproof their Sony Walkmans while on the water. See www.aquapac.net.